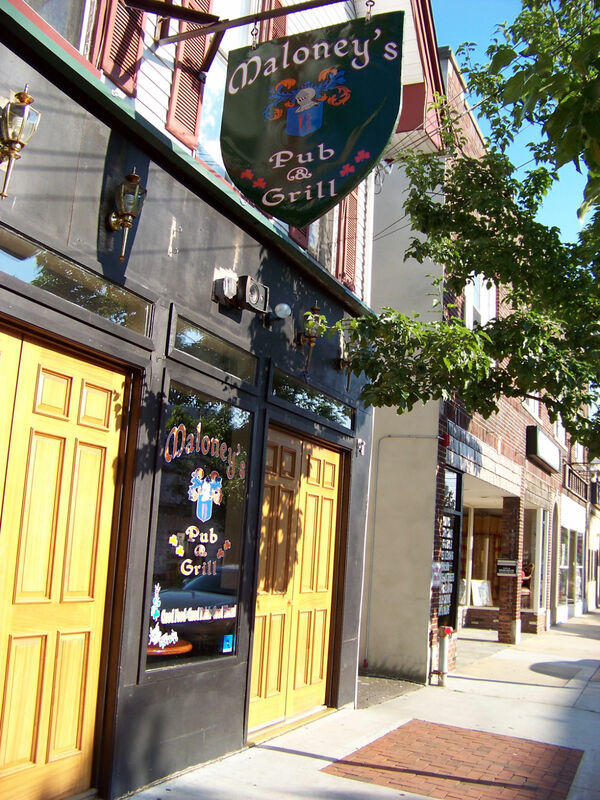 Maloney’s Pub & Grill on Main Street in Matawan, NJ is a difficult pub to writeabout for me. I like the pub, I go there about once a month, but they make it pretty difficult. I want to love the place. It looks right, it feels right, but the service and food need improvement and consistency. The owners genuinely want to have a real Irish feel, but it’s a little hard when business is slow. Not too many of the clientele care about an Irish atmosphere and you don’t want to drive away the regulars. So I can understand their dilemma. Next, the layout. 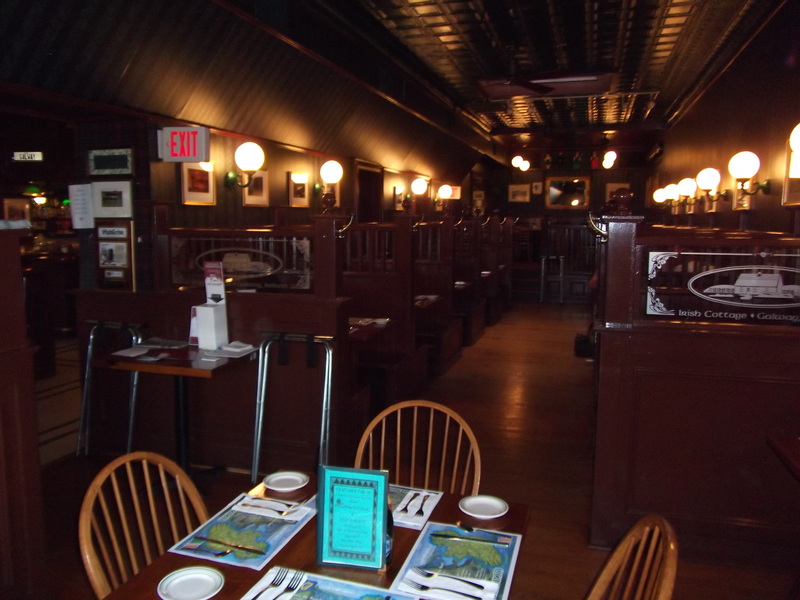 Maloney’s, split into three sections, has a bar area with table seating, a section of booths and a table area. 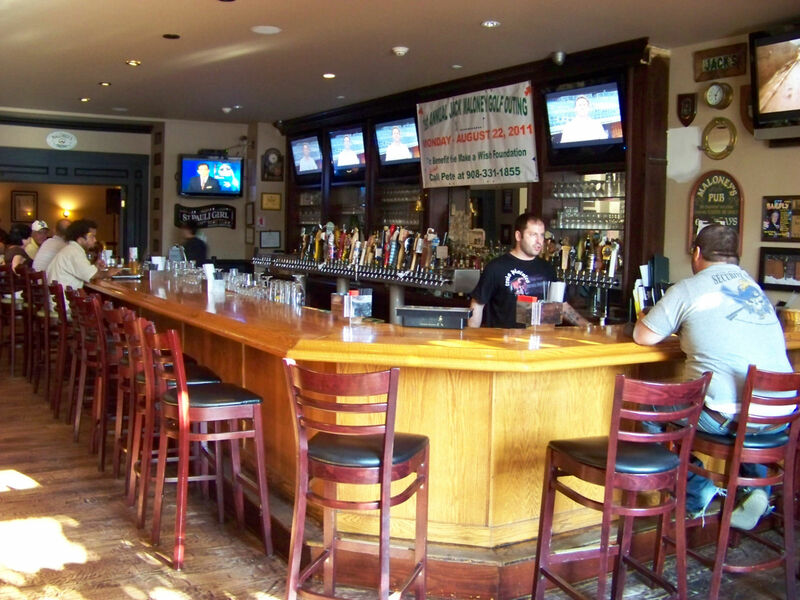 The L-shaped bar can seat around 20 people and there are about 8 tables. I really like the hurley sticks by the bar tables. They also have Guinness mirrors and posters of Irish pubs. It truly looks nice. Eight six-person booths are located behind the bar tables. This area is great if you’re looking for a secluded are for a date or a family dinner where you don’t have to shout to the person next to you. Each booth has it’s own picture of Ireland or a framed poem. The dining area has about 20 tables that seat 4 people. Framed Guinness posters are the big decorations here, along with a personal touch. The owner’s father-in-law served in the military and the flag from his funeral, along with a plaque serve as a nice centerpiece in the room, honoring his memory and everyone else serving or who has served our country. beers that they only carry when they have it. Maloney’s still offers a wide variety of beer, but not as much as they advertise. The Guinness is o.k. Nothing great, but o.k. It’s not served in the 20oz tulip glass, or even the 16oz Guinness glass, just a regular American pint glass. Only one person there can get the pour right, otherwise you get half a glass of foam. So again, Maloney’s comes up iffy. Kevin Guerin and Round the House Band play there once a month on a Sunday evening. That’s the only time I normally go and the place is near empty other than the group I go with. All in all, it’s worth the risk, but if you get a meal not up to par, don’t say I didn’t warn ya. Then again, it could come out extraordinary. Til next time. 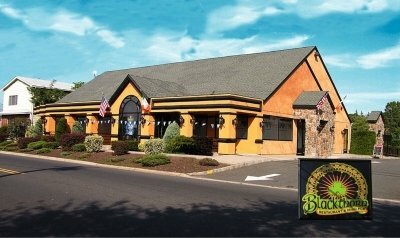 Located in Sommerville, NJ, Mannion’s Irish Pub has captured the Irish spirit to create an awesome pub in northern Jersey. 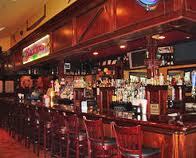 Mannion’s is separated into two rooms, the Bar, and a dining area. While not a big as the Blackthorn, Mannion’s reminds me of a pub you would find in the city. It’s only logical that a man from Galway, a city with great night life, would replicate a pub from his home town. romantic evening or a night out with the family. 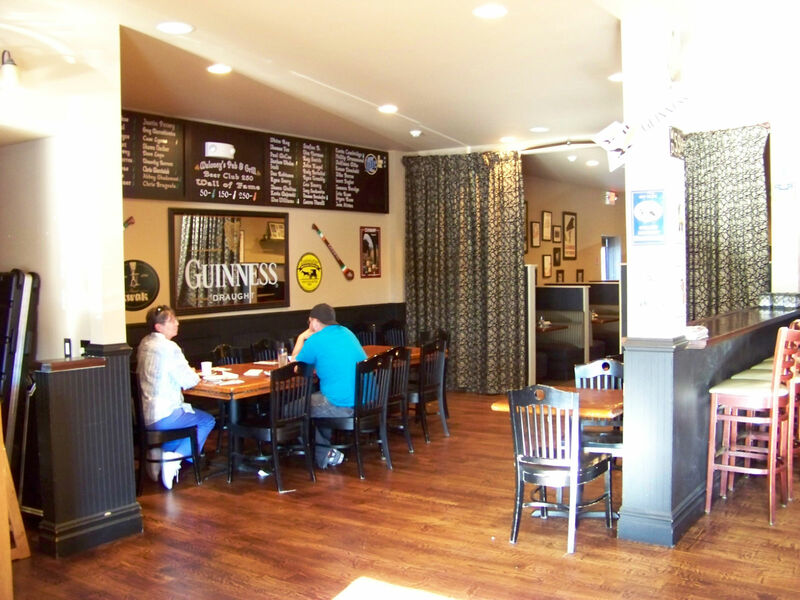 The lack of decorations in the dining area adds to the authenticity of the decor, because true Irish pubs don’t fill every inch of wall space they have. Pictures of Ireland displayed in between the wall lamps adequately decorate the room, but do not create a distraction. The bar area is just a nice. The walls are a little more cluttered than the dining area, but it’s a bar, so it’s allowed to be more over the top. You con prop yourself up at the bar, sit along the counter opposite of the bar or in a seating area with five tables, great to get the bar atmosphere while enjoying a meal. The food was more than satisfactory. The generous serving of fish and chips was more than I could finish, which should speak in volumes. Mannion’s serves some of the best fish and chips I’ve had this side of the Atlantic. You get three cuts of beer-battered fish, each about eight to nine inches long and thick too. They aren’t over-breaded to add to the thickness, you get your fair share of fish. The fish comes served on a mound of steak fries with a side of tartar sauce and lemon slices, a feast for $10. The Willie Lynch Band plays at Mannion’s as well. 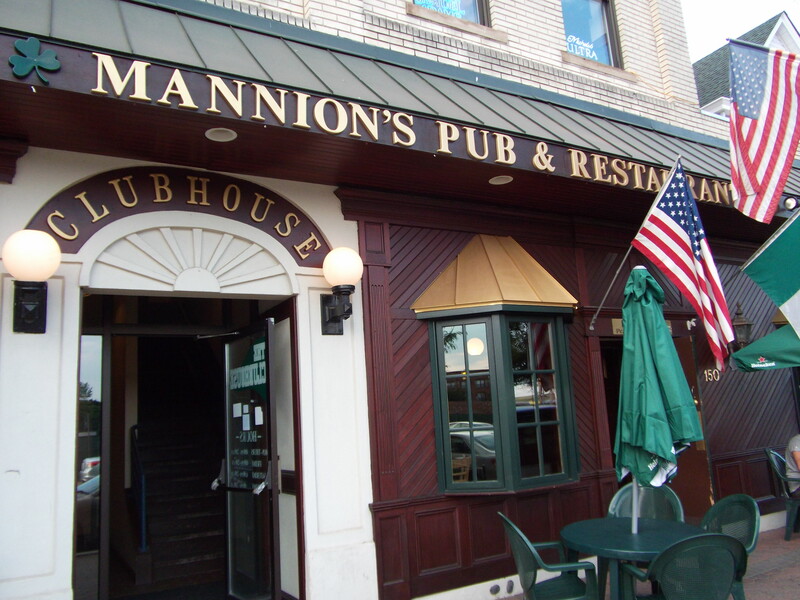 I’m not too familiar with Mannion’s, but they do have a Clubhouse upstairs that’s more of an American bar where they offer karaoke once a week. From my short time there, I definitely recommend it for a meal. I cannot agree more. Irish immigrants own the Blackthorn and pride themselves on providing a genuine Irish pub as if it were plucked from the Irish countryside. A huge pub, the Blackthorn in Kenilworth, has a bar in the main entrance, a dining room, a smaller dining room upstairs and a huge deck for the warmer months. The bartenders, imported from Ireland, have mastered the perfect pour that Guinness brewers strive for, including the European 20oz pint glasses that Guinness SHOULD be served in. The bartenders, waitresses and managers keep their promise of a warm and friendly welcome. 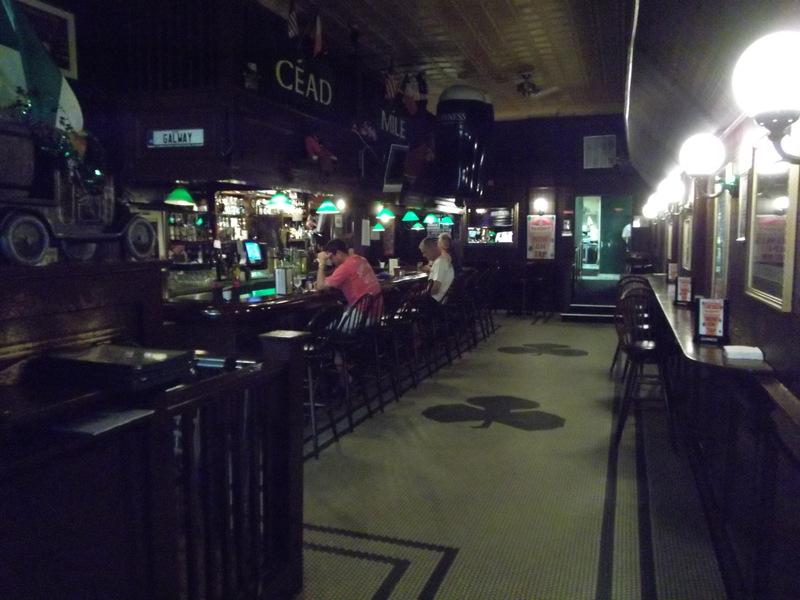 They treat every patron as if they are family, an Irish touch that cannot be replicated. The dining room, located to the left of the bar, is in another room, but patrons can still hear entertainment from the bar and vise versa. The fireplace serves as the focal point of the room and, in the winter months warms the patrons to the core, sheltering them from the harsh New Jersey winters. A beautiful mural, painted above the mantle, depicts the Irish countryside. When staring at it, you feel like you are in Ireland looking out the window of a pub. The decor matches real Irish pubs to a tee, especially the booth that runs parallel to the fireplace. It is a bit cushier than most booths in Ireland, but I don’t think anyone would complain about a little more padding. The Irish cuisine served at the Blackthorn is just grand, but my favorite entree is their Celtic Burger. Cooked to your liking, the Celtic Burger is served with cheddar cheese, sauteed onions, barbecue sauce and Irish bacon. Irish Bacon, cut thicker and wider, looks nothing like our bacon, but is still delicious. Despite favoring the Celtic Burger, ordering the same thing every time I go is never an option. The food at the Blackthorn is some of the best I’ve had. The atmosphere and patrons are as warm as the fireplace. If you are looking to meet people, simply sit yourself at the barand introduce yourself. One of the friends I met there looked like he could be a nasty S.O.B. but, as a person who talks to everyone, I introduced myself and discovered looks can be deceiving. I really enjoy talking with the bartenders. They will gladly share stories about the homeland, where they’re from and how or why they came to America. The Blackthorn offers entertainment multiple nights a week and appeals to people of all ages. DJs and bands frequent the Blackthorn and not only Irish music is played. Younger bands such as The Benjamins played there this past December. Like McDonagh’s, The Willie Lynch band frequents there, but the Round the House Band, another great local band, performs there as well. 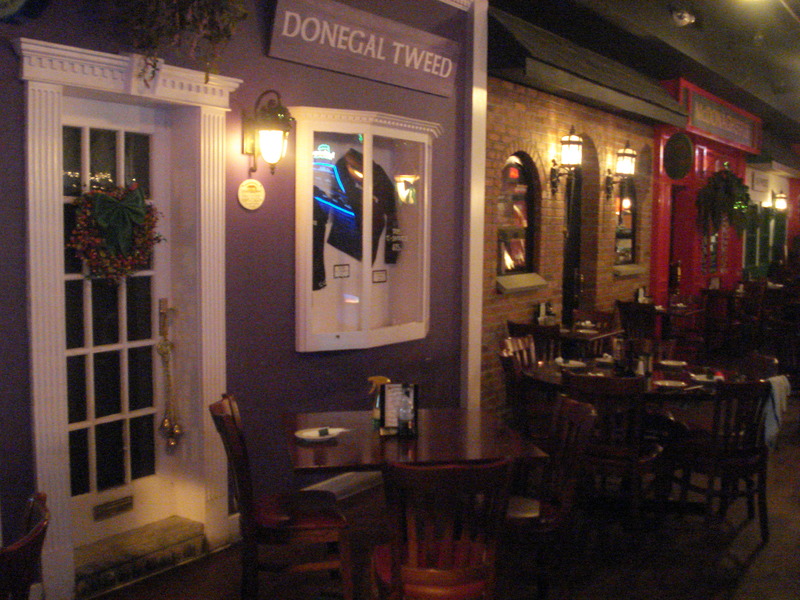 The first pub I chose to blog about is the first in my heart, McDonagh’s Pub in Keyport, NJ. I have been going to McDonagh’s for about six years and fell in love with the place the first time I went. 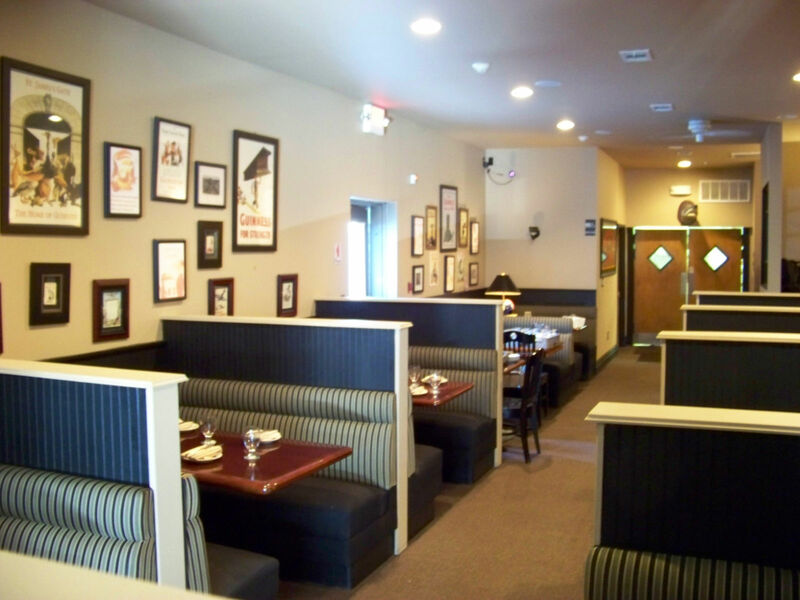 A five and a half foot wall tastefully splits the interior in two, separating the bar from the restaurant, allowing a family friendly atmosphere on one side and a great bar on the other. The next thing that should catch your attention should be the left wall. Constructed after a typical street in Ireland, the wall features storefronts with doors and windows, including a bookstore with a display case of Ireland’s most famous authors. In addition to the street wall, pictures of the Irish countryside and Irish patriots occupy the other walls, enhancing the great atmosphere. 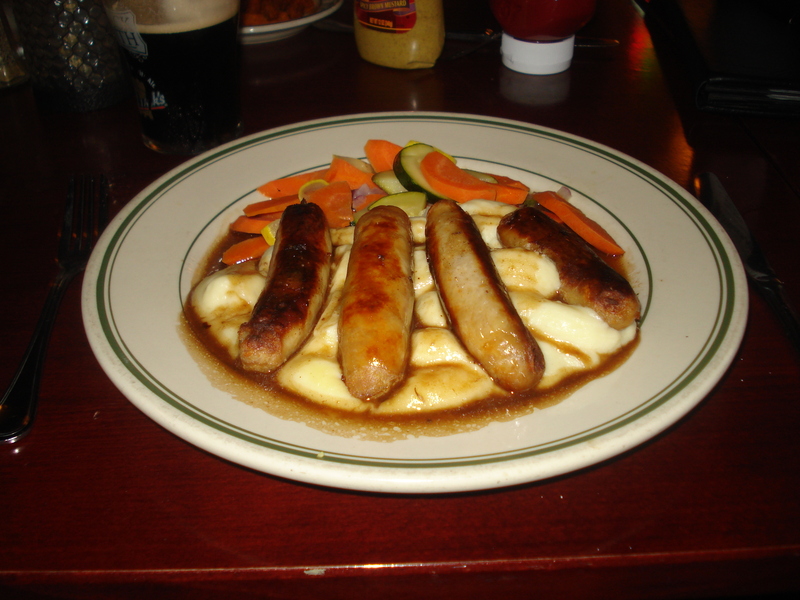 My favorite Irish dish is Bangers and Mash. It is pork Irish sausage, served over mashed potatoes with brown gravy and onions drizzled on top- incredible, if done right. If you’re looking for a simple burger, McDonsgh’s burgers are out of this world and offer a wide variety of toppings. They also offer an incredible thin crust pizza. In the seven years I have been going to McDonagh’s, I never heard of anyone I went with having a bad meal. 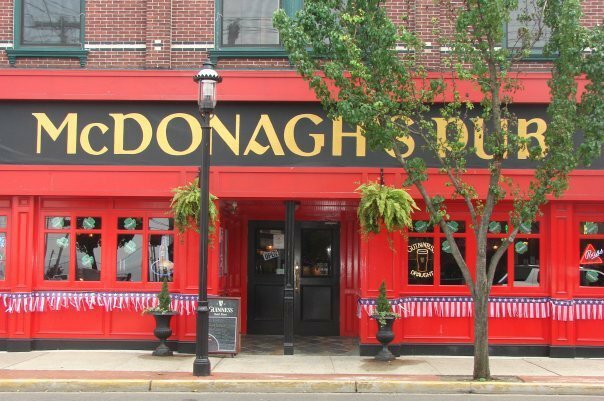 McDonagh’s offers a variety of live entertainment. Bands and DJs frequent McDonagh’s and when they have nothing going on, their surplus of flat screen tvs make it an ideal place to sit with friends and watch a game. If you really wan the full blown Irish experience, then go when the Willie Lynch Band plays and I assure you, you will love it. My name is E.J. Campbell and if you’ve read my “About Me,” you know that I love my Irish heritage and, in particular, pub life. I had the pleasure of touring Ireland twice and have “studied” in countless pubs along the way. 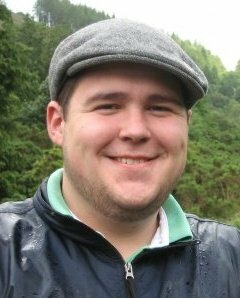 While I do not consider myself an expert, I thought this blog may help people looking for an authentic Irish experience without the plane ride. A few things I will be discussing in my blog will be the atmosphere, food appearance and entertainment of each pub.